Below are a number of graphs (clickable for larger versions) about GFED4s and differences with GFED3. 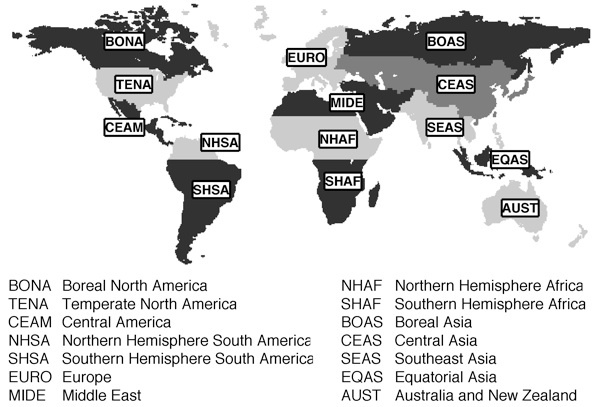 The abbreviations refer to our basis regions. Burned fraction (left), fuel consumption (middle), and emissions (right). All averaged over 1997-2014. 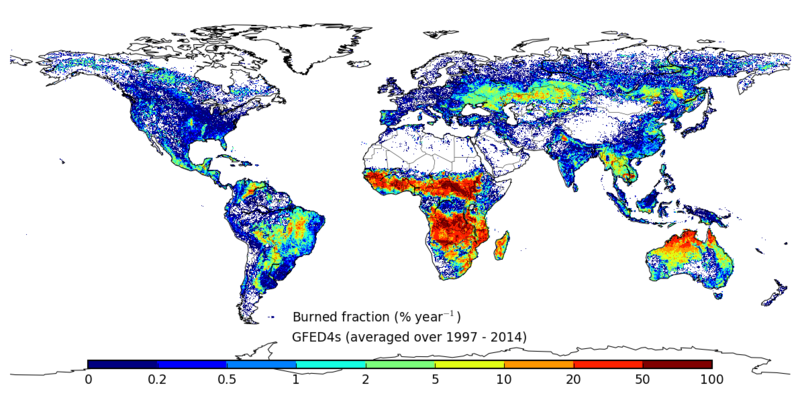 Annual (left, with contributions from the various fire types) and monthly emissions (right, split between GFED4 and GFED4s) over 1997-2014. Relative differences between GFED4 (grey bars) and GFED4s (black bars) versus GFED3, averaged over 1997-2011. Left panel: the small fire burned area led to increased burned area in most regions where small fires (for example agricultural waste burning) are dominant. 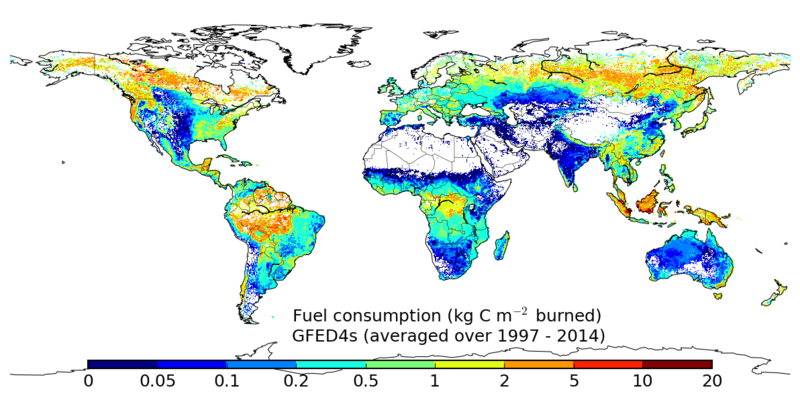 2nd panel: herbaceous fuel consumption was lowered in our model to better match observations. 3th panel: total carbon emissions were somewhat higher on a global scale, but regionally differences were larger depending on the balance between the in general increased burned area and decreased fuel consumption. Right panel: the use of new emission factors also led to changes. For carbon monixide (CO) as shown here, separating extratropical forest into boreal and temperate forest as done in Akagi et al. 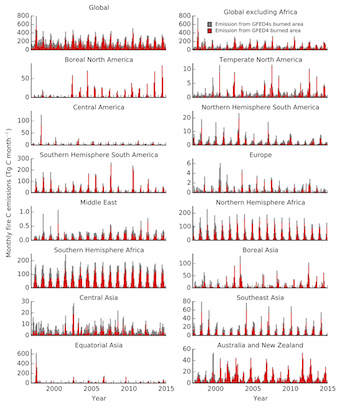 (2011) led to increased CO:C ratios in the boreal, and decreases in this ratio in temperate forests. 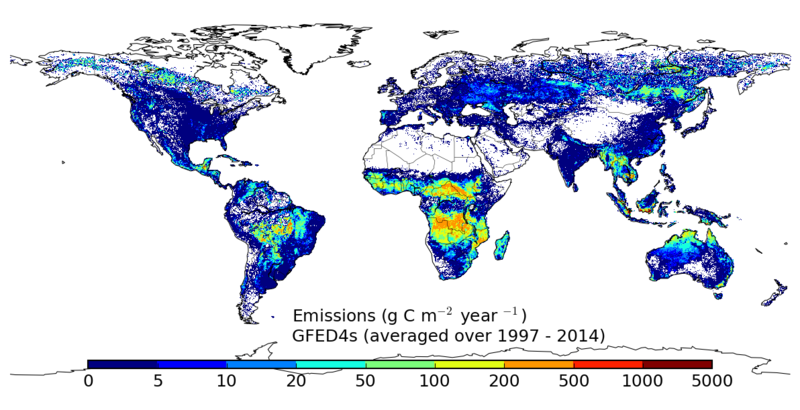 For some species the differences in emission factors was substantial, on a global scale CH4 emissions for example were 25% lower than in GFED3 mainly because of the new emission factors used.